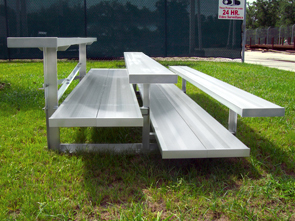 These aluminum bleachers feature double footboards on all rows for extra footing safety and comfort on all levels. Picket guardrail is available on four row unit with ADA compliant center space. Tip and Roll kit is available on all units and allows to easily tip the bleachers into the upright position. Using the four 5" non-marring swivel casters, simply roll the unit to its storage spot. 2, 3, 4, 5 Row Units. 7'-6", 9', 15', 21' & 27" Lengths. Double Footboards on All Rows. Optional Picket Guardrail and ADA Center Space on 4 Row Unit.